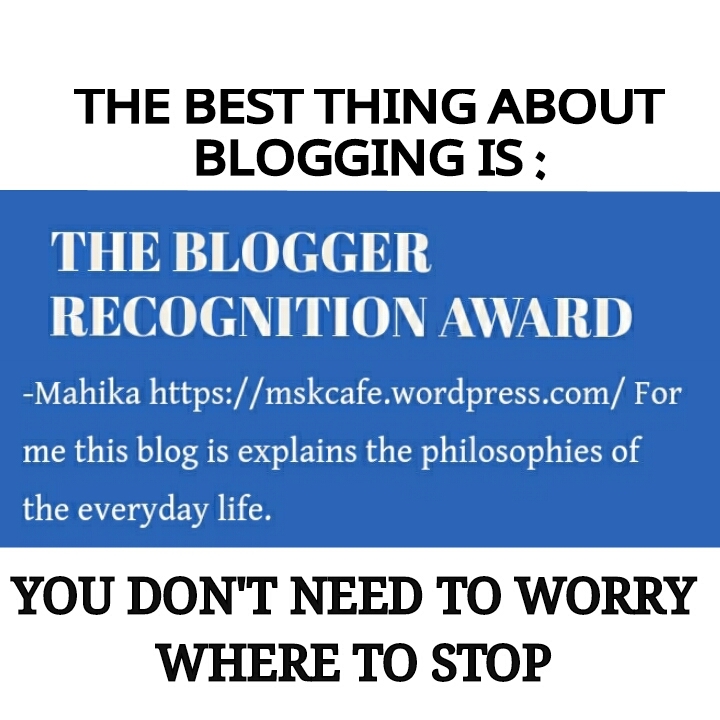 THE BLOGGER RECOGNITION AWARD !! When I saw this post and feedback about my blog on my wordpress timeline, the first eye catching sentence was : “publish a blog about this award ” . So here it is . I started blogging after I finished with my last entrance exam . That’s because I had lot of time then and I was not sure what the results awaited for me . So…..by then I had developed a philosophical outlook to many things . I thought I should express this perspective . Writing a diary was an option but then “”maintenance””😵 that was the obstacle . So I chose to write blogs as nothing is lost from the virtual platform. As I proceeded with my each blog , i realized its not about time I wished to spend , but about my thoughts that I needed to portray . With my blogs I realized there are people who connect with my thoughts and this award made my realization even stronger that not all philosophies are same. Thanks a tonne https://xhorxhinabami.wordpress.com/ for this nomination and the feedback . PreviousWHERE DO YOU RESIDE ? ?